Toby takes each group of kids through warm-ups before they begin the class. Toby Tobin with a drama class at the Northwest Optimist Performing Arts Center. Toby listens as the children audition for parts in the play. All are guaranteed a part although they don't always get their first choice. She reminds them that "there are no small parts-only small actors." The children auditioning for a part during the Monday night drama class at Northwest Optimist. There is no shortage of affection for the big-hearted preforming arts director with the Oklahoma City Parks and Recreation Department. “The stars look down and see a future bright at last.” The cast of Billy Elliot on Broadway sings these lyrics during the play’s opening number and, this past month, one of those cast members was a young boy from the Oklahoma City area. The final words of his biography in the show’s playbill read, “This one’s for you Toby.” Toby is Toby Tobin, the Performing Arts Program Coordinator at NW Optimist Performing Arts Recreation Center in Oklahoma City. 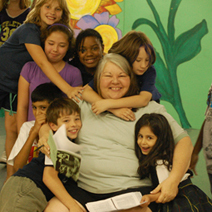 Assisted by a small staff and “a whistle that’s killer”, she runs summer camps and year-round classes to teach the craft of performance art to young, aspiring thespians. This year is Tobin’s seventeenth year with the Parks and Recreation department, the first four of which were part-time and the rest full-time. After obtaining a two-year degree from St. Gregory’s, Tobin went on to Oklahoma University, where she graduated with a B.A. in Fine Arts. Over the years, Tobin has seen a number of her young actors and dancers grow into professional performers, including her own daughter, who is a successful singer/songwriter in Los Angeles. One of her current assistants says that his experience in the camps and classes broadened his horizons, helping him to learn more about himself. “I’ve learned so much more in the five to six years that I’ve been here. I’ve learned to make friends, to open up a bit more, to be the weird person that I am. It started my career as an actor,” he says. Another one of Tobin’s children used her talents not to convince an agent to hire her, but instead to convince her school’s faculty that she was blind and, therefore, could not take that day’s exam. Tobin insists that every student performs at least two lines in every production. “Every kid gets a part, even if I have to write it in myself,” she says, adding, “I think it’s important that they be a part of live theater, and have a feeling of everyone standing and clapping for them.” In a very Glee fashion, her strategy exposes otherwise introverted kids to the thrill of performance and creates a shared sense of ownership within the company. Her ideas must be working, for not only are students consistently returning every year, but former students are also returning as employees. The majority of Tobin’s junior staffers were kids who came up through the camps and decided to stay and work as instructors. Isaiah, a former student and current employee, says, “I started coming to the camps in ’07. I saw the Independence [Middle School] show and I thought, I had to be back next semester.” And when those kids grow up, they send their kids. “I’m teaching the kids of some of my first kids,” Tobin says proudly. With the consistent enrollment growth the company has been experiencing, it will soon need more room than the space they currently operate in. While Tobin is very grateful for the space she has been given, she says that she needs a larger arena in order to build, “a place that’s just for them [and where] kids can be kids . . .I don’t want to have them under my thumb, I don’t want to stifle any of their creativity.” In a larger arena, Tobin says she could consider installing a fly system, a system used to make objects or people “fly” across a stage. However, fly systems use up a large amount of funds as well as space. Helping to provide such funds is Back Stage Players, an organization created by “folks that are invested in the success of the camps.” “All they care about is taking care of the kids,” says Tobin. All proceeds go directly to the NW Optimist Performing Arts Recreation Center. Those involved with Back Stage Players also help build props and sets. Just recently, the non-profit purchased new mirrors for the studio. For more information about community theater for children offered through the Oklahoma City Parks and Recreation Department, contact Toby Tobin at (405) 841-2414. The Northwest Optimist Performing Arts Center is located at 3301 Northwest Grand Boulevard, Oklahoma City, OK 73116. The Backstage Players are in need of financial and in-kind support and can be found on Facebook at www.facebook.com/BackstagePlayers.